Before a rapt audience of forty members of the Graham Self-Reliant Community this week, Sumner-based environmental activist Kelda Miller described the concept of permaculture – the notion of living in a healthy, sustainable manner. As such, permaculture is a broad expansion of living an environmentally sound lifestyle. “But, it’s more than just growing an organic garden,” chimed Louise Carson at the beginning of the presentation when Ms. Miller queried her audience on what they knew of permaculture. Indeed it is much more than growing a garden – even an organic one – as permaculture touches every aspect of life. Besides raising veggies, crops and animals, permaculture involves what kind of homes we live in and how our neighborhoods are developed. Plus, it’s jobs and the economy, our governance, and cultural and spiritual practices – and doing so in a way that in total harmony with the land, thus making it sustainable for the very long-term. 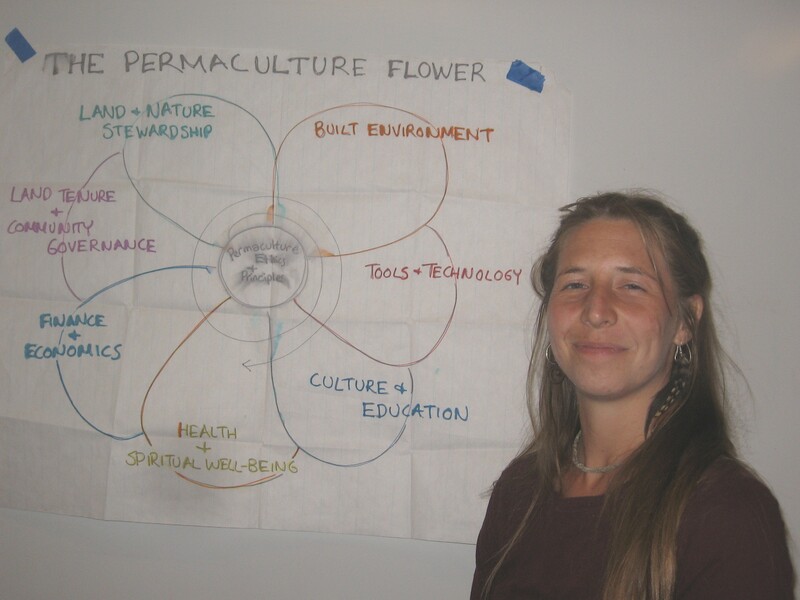 Kelda Miller standing beside her graphic of the permaculture "flower" where each petal describe one of the many aspects of this approach to sustainable living. Simply, permaculture seems to be a movement that tries to shape modern living within the values of ancient indigenous cultures while acknowledging the vast sprawl of our cities and the accompanying technologies that support our burgeoning population. At its core, permaculture possesses the fundamental value of personal self-reliance and building community, the two hallmarks of the G-SRC. As a result, the Graham community was eager to hear from Ms. Miller how they could expand their current efforts to achieve a more self-reliant – and sustainable – community. To begin, Kelda told the group her personal story, which resonated strongly. Miller’s initial foray into permaculture started at the nearby Rogers High School in South Hill when Kelda conducted an independent project during her senior year. Those early ties to the area still exist, and after her Graham presentation Kelda needed to return to her parents’ home in South Hill and await the resumption of bus service to Sumner the following day. After Rogers, Kelda studied “earth skills” at The Evergreen State College, and then immersed herself in several internships – first at Terry’s Berries in Puyallup, and then in an intensive study at the Bullock family’s famous permaculture farm on Orcas Island. 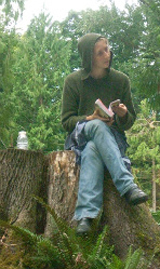 At the latter, Kelda received a keen education in sustainable lifestyles, but she wanted to apply her knowledge to urban landscapes so she moved to Seattle. In the Rain City, Kelda was a true pioneer of permaculture and began her work by building a network of kindred spirits. She developed a web site, organized permaculture events, and eventually started teaching permaculture classes, including at Seattle Tilth. After seven years of teaching in Seattle she returned to south Pierce County and helped form Sustainable Puyallup to give her ideas a framework in which to grow. “I wanted to come back to my roots – come back to the land of urban sprawl and offer my ideas and see if we could do it right,” she said. A "food forest" designed by Kelda. Picture courtesy of Kelda Miller. Currently, she lives in Sumner developing a permaculture “food forest” in her back yard that will one day screen her suburban fence. 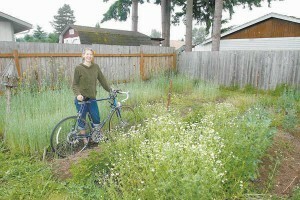 Recently, her landlord gave her the okay to tear up the front lawn and re-plant it permaculture-style. When asked what she grows specifically, Kelda answers with a discussion on “what is food?” Quickly, one learns that her vision of an edible menu is radically different than what is presented on the grocery aisles at Safeway. “Weeds can be food, and ornamentals can be eaten – so much of what grows can sustain us,” she said. Kelda described her “garden” as really a vast thriving field of greenery and fruit trees with a strong accent on perennials and self-seeding crops. Edible species are interspersed among the ornamentals, which minimizes disease and fosters a healthy ecosystem that becomes home to harmonious populations of animals and insects. As for food, Kelda’s garden produces artichokes, onions and persimmons, and she also raises plenty of herbs, such as comfrey and mallow. A suburban back yard transforms with the first stages of a permaculture garden. Picture courtesy of Kelda Miller. She also plants species that do not need watering, which is a feature of permacultural gardening. Kelda also acknowledged that she has received a complaint letter from the Sumner City Council, informing her that at least one neighbor is not happy with the changes to the local landscape. However, Kelda also said that she is sharing her produce with plenty of appreciative neighbors, and they are beginning to follow her lead as well. Expanding beyond crops, Kelda also touts the practice of raising goats, and she described how one herd she works with are rotated from field to field, devouring scotch broom and blackberries. Then pigs can be brought it to harvest the roots, after which the pigs leave behind a very rich soil that is ready for planting. As for sustainable building practices, Kelda champions the use of “cob,” an ancient mixture of sand, clay and straw that is packed in place to form strong walls, often possessing graceful, fluid lines that make it seem like a sculpture. Cob walls can be a foot or two thick and will support a two-story structure. On top, Kelda recommends a conventional roof with a substantial overhang. “Cob is subject to erosion from the rain,” she said. Cob buildings also encourage community sharing as they usually require a lot of hands and feet to combine the mixture and put it in place. Further, such labor-intensive homes tend to be small, which further encourages occupants to spend more time outside and thus increase the opportunities to mingle with one’s neighbors. Kelda also champions the use of photovoltaic panels to generate electricity, but she readily acknowledges that an alternative energy system will require several components to handle rainy cold winters. She recommends PV panels and a passive solar heat system coupled with wind generators and a hydro-system for winter-time electrical generation. She also lauded a new heating device called a “rocket mass heater,” which is a small wood-burning stove that is ensconced in the cob and radiates its heat evenly through the earthen mass. “It’s more comfortable to heat mass than air,” Kelda said. Kelda also said that permaculture expands communities beyond the traditional collection of nuclear-families. She described how extended families can live in various settings such as family compounds, or individuals can come together and form an inter-generational home. Also these kinds of groups can even cluster to from an intentional community. Regarding education and culture, which is vital to the G-SRC since several families home-school, permaculture believes that basic life skills can be taught in the garden or building a home, such as math, business, and problem-solving – even learning the skills necessary to deal successfully with governmental bureaucracies, such as the Health Department when one needs to get a food-handler’s permit. Along those lines, permaculture fosters the notion of “value-added” economies, such as making lotions or potions from home-grown herbs. Further, permaculture provides a comprehensive framework of how local economies can function, including establishing a local currency such as the “Life Dollars” that the G-SRC considered several months ago. Bartering is also a major component of permaculture economics. Evening permaculture classes with Kelda commence this week. 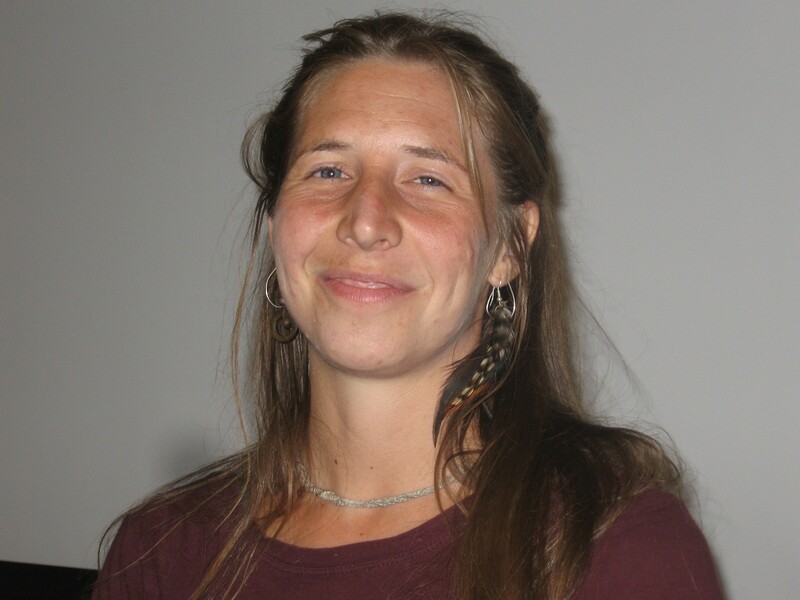 For those wishing to learn more, Kelda regularly teaches her permaculture courses in Tacoma at the Congressional Church on Division, near Wright Park. The course involves 72-hours of instruction and takes place on consecutive weekends from November until February. Cost ranges from $700-900. Low-cost or no-cost Friday evening sessions are also available, and begin in September. For more information on this program, call (253) 370-9946, or email kelda@riseup.net. 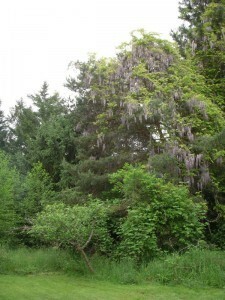 In addition, you can follow Kelda’s work on her permaculture web site and blog http://divinearthgp.com . Those wishing a more immediate experience of permaculture can attend a number of local events, such as the Olympia Family Barter Fair on September 10-11, at the “Cabana on Shincke,” 4326 Shincke Rd NE in Olympia. http://www.oly-wa.us/olybarter/ . In addition, the Northwest Permaculture Convergence will be held in Portland, Oregon from October 13-16, 2011; www.nwpermaculture.com . 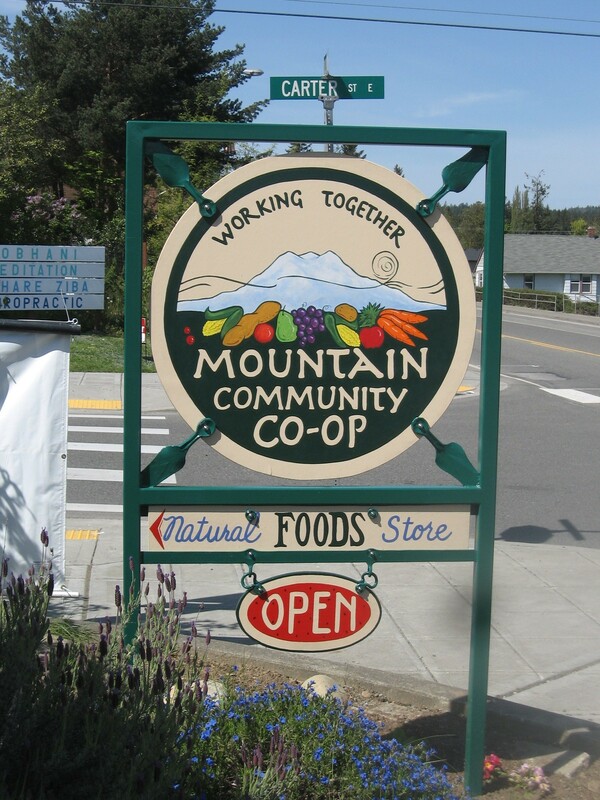 Mountain Community Coop – Open to All! Julie’s Organic Ice Cream is now in – $3.99 per quart – Yum! In Eatonville – 1/2 block off the main street – look for our sign! This entry was posted in Business, Culture, Environment, Graham News, Self Reliance, South Hill. Bookmark the permalink. It all sounds good if one doesn’t have a job or family/children or deer that would eat a garden in many places, demands etc. I, for one, am thrilled that I can go to the super market and purchase good food. I spent many years growing chickens, beef, and, a large garden and we didn’t need the new vocabulary to discribe it. Also, one may want to google Agenda 21 to see what many in this world say about Sustainability. So, if you enjoy doing what Kelda teaches, great! Have fun, spend lots of money, but don’t discriminate against those who are thankful that they don’t have to follow along. I, too, am glad I can still get Fig Newtons at the Safeway. Claudia, but I do enjoy Kelda’s concepts for living in a loving community. What do you know of the Agenda 21? I’ve heard a little and I’m not sure how truthful the information is concerning a super-dooper program of mandated living in urban centers. I like to have my information from direct sources. That may not be possible in this instance, though. How does one get someone on TED, Tracey? Further, how do you go see a TED presentation? As for Kelda, I felt I was seeing a true home-grown commmunity leader step forward and claim her power. Her talk was substantive and she spoke authoritatively. I am thankful that Kelda Miller is part of our community.